Rockin Sr Publishing, 9780982157619, 229pp. Book One - the #1 bestselling Threads West-winner of eight national awards in the categories of Historical Fiction, Romance and Western. This is the namesake novel of the sweeping Threads West, An American Saga multi-era series compared by reviewers and authors to Lonesome Dove, Centennial, and Louis L'Amour. Called by some The Gone With The Wind of the West and applauded by others as rings true and poignant, as authentic and moving as Dances with Wolves. The tale bursts with the adventure, romance and promise of historical America and the West. You will recognize the characters who live in these pages. They are the ancestors of your friends, your neighbors, your co-workers, and your family. They are you. They are us. This is not only their story. It is our story. The epic saga of Threads West, An American Saga begins in 1854 with the first of five, richly textured, complex generations of unforgettable, multicultural characters. The separate lives of these driven men and independent women from Europe and America are drawn to a common destiny that beckons seductively from the wild and remote flanks of the American West. Swept into the dangerous currents of the far-distant frontier by the mysterious rivers of fate, the power of the land and the American spirit, their journeys are turbulent quests intertwined with romance and adversity, passions and pathos, despair and triumph. One thousand miles to the west of St. Louis lies the lawless untamed spine of the continent, the Rocky Mountains. Their energy draws this vanguard of generations to love and struggle in the beautifully vibrant but unforgiving landscape of the West. The personal conflicts inherent to these brave, passion-filled characters are exacerbated by a nation in transition, the budding enmity between North and South, broken treaties with Native Americans and the accelerating melting pot of diverse cultures that marks this magical moment in American history. The touchstones of the past are the guideposts to the future. This is the first novel of this epic saga-the tale of America, set in the West-the stirring story of many threads of uncommon cultures, differing origins and competing ambitions that entwine into the American spirit. Lives and generations are woven on the loom of history, propelled by fate and freedom to form the tapestry that becomes the whole cloth of the nation. It is uniquely American, this meld of the mosaic. In Book Two, Maps of Fate, the heroic but conflicted men and women of Threads West continue their dangerous journeys, pushing relentlessly westward, their paths intersecting with the trails of others, setting in motion generational liaisons that cannot be foreseen. Momentous change will continue, igniting further greed and compassion, courage and treachery, rugged independence, torrid passions and fierce loyalties. The decades of the Maps of Fate era novels of Threads West, An American Saga book series become the crucible of the souls of generations, the building of the heart of the nation, the destiny of a people, and the relentless energy and beauty of the western landscape. This is the ongoing story of us. Set in authentic locations on three continents and in the jagged peaks of the Rocky Mountains, the life threads of the characters -- whose personalities are forged on the anvil of the land and shaped by the spirit of America -- live, love, struggle, die, fail and succeed. They have neither country nor culture in common -- but the textured, complex and conflicted lives of these independent men and women become part of the fabric of the undulating landscape of the West, and are woven into the rich and adventurous tapestry of an emerging nation and the ever evolving American spirit. The adventure and romance of America, her people and her spirit and the West. This is not only their story. It is our story. 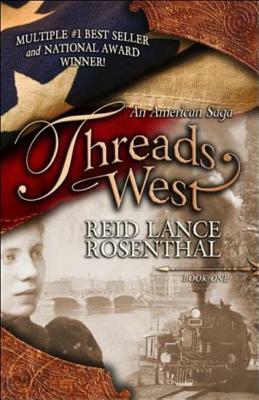 It is Threads West, An American Saga.